The Public Counter staff provides information about Planning related Zoning and Subdivision regulations and General Plan policies in the unincorporated areas of Ventura County. They do not handle matters within a city. The Counter issues Ministerial permits and distributes applications for Discretionary permits. You may access all of the available permit applications on our website here. If you wish to have your project reviewed for its feasibility, this can be done for a fee and a Presubmittal Review application must be filled out and submitted to the Public Counter. Check to see your approximate wait times by checking the live Counter Traffic Cam. If you seek information regarding a specific property, you need to provide the Assessor's Parcel Number (APN) for the site. To identify the property’s APN, click here. 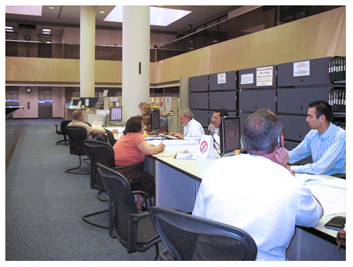 The Planning Counter is located on the 3rd floor of the Hall of Administration at the County Government Center Complex. The complex is located at 800 South Victoria Ave. between the Santa Paula (126) Freeway and Telephone Rd. Do I need to make an appointment to meet with Planning Staff? If you want to meet with a specific planner to discuss a project, you are advised to make an appointment with him/her to ensure he/she will be available. Click here to obtain phone numbers and email addresses for the Planning staff. The clerical and Public Counter staff do not make appointments for members of the Planning staff. Additional resources and contact information can be found on the Planning Division Contact Us web page. The Planning Division accepts the following forms of payment: cash, check or money order made payable to the County of Ventura, Planning Division, and credit cards (some exceptions apply).